The Shower Debate: Morning Vs. Night – The Small Things. Yes, I am posting about showing and no, the question is not should I have a shower… because if you are ever asking yourself that question the answer should always be yes. Go take a shower. The question is what is the optimal time of day to shower for a Nine-to-Fiver like myself. I’ve created a pretty comprehensive pro and con list for morning showering and night showering, which I am obviously going to share. But first I’d like to know your option on this news worthy subject. 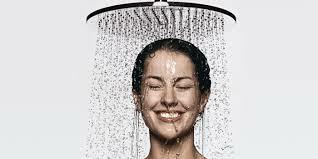 It wakes you up: When I shower in the morning my days are much more focused and productive. You are guaranteed to smell good all day: There is nothing nicer than the smell of soap and shampoo. Am I right? Your hair will stay voluptuous longer: My hair tends to lose it’s bounce after its been slept on. You have to wake up early: Morning showering takes my morning routine from 20 minutes to a full hour, which means way less sleep. If you don’t have the time to style then your hair will dry puffy: At least mine will, my hair is great for styling but when it air dries it is frizzy and puffy and just terrible. Damp hair outside in the winter is very cold: Canada is the wrong place to go outside with wet hair for 8 out of 12 months in the year. You have plenty of time to dry & style your hair: The only time constraint you have is your bed time. Braiding your hair and sleeping on it wet is the easiest way to get beach waves: I love a good curly do. Especially in the middle of winter, it allows me to reminisce on warmer days. Cleaning off after a long day is so refreshing: Standing under the water at the end of the day is possibly the most satisfying feeling ever. Wanting to go to bed and being forced to wait for your hair to dry: This is the worst. All you want to do is sleep but you know that if you sleep on your hair right now it will end up looking like a mess in the morning. You can’t use hair oil: Because you will look like a grease ball if you don’t wake up and wash it out. You have so many other things to do: When you need to do laundry, make lunch, exercise and watch your favourite tv show… showering is the last thing on the list. Well, that just about sums up my thought processes. It seems as though I think about my hair a lot. Do you have any more to add to the list? Let me know in the comments! Showering: Morning Vs Night. Who will you vote for? A short but very SWEET visit with da fwends! ❤️ I just love you guys! Wishing a very happy 26th birthday to this handsome fella 🎈 I love you! A Garden of Health and Wellness. ~ All the things we think but never say out loud…a mixture of emotions.